There is currently a trend on Facebook of listing three positive things a day for seven days. I really like that idea. 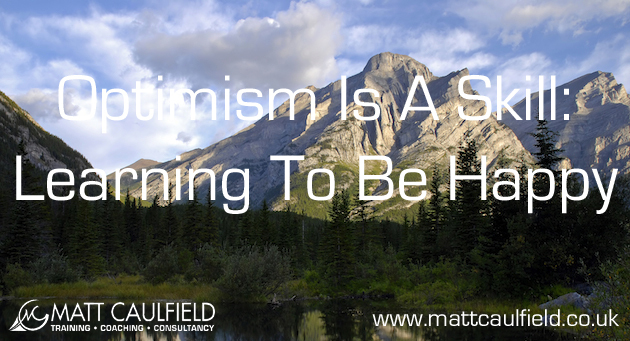 I am fairly convinced that Optimism is a skill and we can teach ourselves to be more optimistic. And since optimists tend to be healthier and live longer (as well as being less depressed, stressed and have better coping skills for hard times) it is a skill that is well worth learning. Cognitive Bias Modification (CBM) is a process that trains us to alter our biases to what we pay attention to (it was the one of the subjects of a recent Horizon episode “The Truth About Personality” with Dr Michael Mosley ). If we habitually pay attention to the negative this will effect how we feel. So practice paying attention to the positive, the happy and the meaningful. Bradley Cooper, the Hollywood actor, says that he starts each day by listing things he is grateful for. And if it is good enough for him, it is good enough for us all! Start the day by looking at the positives you already have in your life. Once you practice gratitude for a while you will start to notice that the things you are most grateful for are the simple things. It may be interesting and useful to keep a note of these two things in a diary or note book. This serves two purposes; you can track your moods and state of mind more accurately and, if you find yourself being a bit down in the dumps, it can act as a reminder or a trigger to change your state. I have been practicing meditation and Buddhism for around 20 years so it is nice to see that psychologists have caught up with 3,500 years of Buddhist thought! Mindfulness has been the hot topic recently. Studies have suggested that by developing a regular mindful practice (you do not need to sit cross legged on a mat staring at your navel to be mindful) you can reduce symptoms of depression, chronic pain, anxiety disorders and OCD. It can also reduce stress, lower blood pressure, treat heart disease and improve the quality of your sleep. It can even make physical changes to our brain, resulting in brain changes that may be protective against mental illness. When you harbour ill thoughts about someone, or get angry and annoyed with someone (or everyone!) the only person you are actually making feel bad is yourself. So, it is better for you (and for the world around you) to be understanding and compassionate. Being compassionate is not about being a drip or a push over. It is about acknowledging that we are all doing the best we can on this crazy planet. Make the effort to be polite and well mannered. If you make the effort to be nice to people around you, you will feel nicer yourself. When we are happy we smile and when we smile we are happy. Studies have shown that simply by smiling our brain releases the same cocktails of neuro-chemicals that we would release if we were actually feeling happy. So plastering a big fake smile your face you will start to feel happier and soon that fake smile will become a real one. Our body and mind are one system (or at least, interconnected systems), what happens in one effects the other. Psychological stress can manifest itself in physical ways, in the same way that illness or injury can have a negative affect on our mood and psychological wellbeing. So, relax your body and your mind will follow. For a full relaxation primer, please click here. When you are in the depths of a negative, pessimistic thought (and the same goes for a positive, optimistic thought), we get so wrapped up the content that we rarely pay attention to the fact that we are seeing the pictures in a particular way. Fritz Pearls, the Gestalt Therapist and major influence on NLP, recognised that the pictures we create in the “cinema of our mind” are coded by our emotional state. So by changing the pictures you can change your emotional response to them. If you find yourself indulging in negative thoughts, step out of the pictures, make them black and white, push them further away or make them smaller. If you are recalling a good time, make the picture bigger and brighter, step into it and relive it as if you are back there now. There is an old saying that “if you don’t have anything nice to say, don’t say it at all”. So, pay attention to how you talk to yourself, are you constantly muttering and moaning? Putting yourself down? In a bad tone? Change the voices. When criticising yourself change the voice to someone who you think talks nonsense. Make the effort to say nice things to yourself in a nice voice (maybe don’t do this out loud, you may get some odd looks). We tend to pay attention to what is different. if something is the same all the time we stop consciously noticing it (it is a process known as habituation). If it was sunny all the time, we would soon stop appreciating it. The bad experiences are what make the good times feel so good. So if you find yourself going through a dark patch for awhile, be mindful of it, don’t fight it, accept it as the natural ebb and flow of life. This post contains edited excerpts from my forthcoming book “How To Think”. We so often get wrapped up in our thoughts that we forget that they are just thoughts. We act as if they are real and are really happening to us, right now. Our mind is rubbish at telling the difference between imagination and reality and we do not respond to an event, we respond to our interpretation (or thoughts about) an event. This is one of the key tenants of NLP and of Mindfulness, to recognised that thoughts are just thoughts. Once we recognise that we can start to take control of our thoughts. When you find yourself absorbed in a thought, memory or feeling, literally imagine yourself “stepping back” out of the thoughts so that it is like you are watching them on a TV screen. Notice the details (submodalities) of the image; the size and shape, the location in space, whether it is like a photograph or a movie. Pay attention to the sounds, are you talking to yourself? If so, what are you saying? Notice the feelings that this thought is creating. Whilst you are doing this it is important not to place any good/bad value judgement on it. If you do you are interpreting the thought, and that means you have been caught in the trap of “thinking about thinking”, you haven’t stepped out of the thought, just added an extra layer of detail. You are, at this stage only interested in noticing the sensory specific data. When you find yourself absorbed and being carries away by thoughts and feelings, start to label the thought. Say yourself “Having a thought about…”, “Feeling…”, etc. With practice you will start noticing the thoughts arising and be able to do something with them (or not, it is up to you). It is important to practice this, to begin with at least, with every thought you catch yourself involved in. This way, you can start to learn to control your thoughts, not let them control you. You can intensify those thoughts,memories and and feelings that are useful and de-intensify those which you find un-useful. In this videoblog, I talk about how we rarely respond to the stimulus in the environment, we respond to our interpretation of that stimulus or the meaning we place on it. To change your response, don’t change the stimulus, change the meaning. In a previous post here, I talked about keeping it simple, and, taking my own advice, I have reorganised how I present my trainings. They will now be split into qualification trainings, that offer specific NLP qualifications, and Master Classes that are seminars and workshops focusing on a specific area of NLP or associated fields. For more details please click here to visit the Master Class page. In addition, I have re-launched and completely updated my Business Practitioner of NLP training programme, this is thoroughly unique training, taking NLP for business in a new direction. An NLP Practitioner is someone who has learned to use the attitudes, principles and techniques of NLP as they are intended to be used, by its creator, for themselves and with others. A MASTER Practitioner of NLP is someone who has mastered the creative and innovative applications of the principles and methodology of NLP. They are highly skilled communicators, able to easily change their own behaviours and those of others. A Business Practitioner of NLP is someone who has learned to apply the attitude, skills and methodology to the NLP in a corporate environment. My NLP Master Classes are one and two day workshops and seminars on a particular area of NLP or associated fields. They are designed for someone already experienced in NLP to deepen and broaden their knowledge and skill. To book on any of these workshops, please click here. A good communicator takes responsibility for all nuances of their communication. Yet, it astounds me how many professional communicators and NLPers pay very little attention to the quality of their speaking voice. In this workshop you will understand how the voice works, as well as go through vocal warm up exercises to help you improve the quality of your voice. Practitioner as part of our flagship Practitioner training. An entertaining day of using NLP and hypnosis for fun (and profit!). These impressive skills are not magic tricks, they are applications of psychological techniques, including NLP and hypnosis for entertainment purposes. More and more individuals and businesses are asking for coaching and the growth of coaching companies is dramatically increasing. If you are already an NLP Practitioner or Master Practitioner, you can do a 2-day “fast-track” training to become a licensed NLP Coach. Go from Business “Novice” to Professional Practitioner in Just 2 Days. In this Master Class you will be taken step-by-step through the process that will take you from scratch to having a complete business and marketing plan in JUST 2 days! Mindfulness is a HOT topic right now, with Mindfulness Based CBT becoming one of the most sought -after therapeutic applications of the moment. Mindfulness and NLP go hand in hand and by learning about Mindfulness you can improve your own NLP skills and have additional approaches that can improve your success rate with clients. Supervision days are a loose and relaxed day of practicing and revising the skills you have learned on your NLP training so far. Before each day I send out a question to find out what it is you want to practice in the day. remember: these works assume a working knowledge of NLP, although you do not need to have a formal qualification in NLP to attend, it is essential that you have some experience or my find it will all go over your head. If you are unsure please contact me to have a chat about it.